Do you want to fast to the Lord without hunger, pain, or a bad attitude? Do you want to fast gloriously and with more power than you’ve ever dreamed you could have? The Lord woke me up around 1:00 this morning and told me to record a teaching on fasting. I hadn’t planned to do so, but He wrecked me for fasting recently when I read a new-old book. The book was Franklin Hall’s Atomic Power with God thru Fasting and Prayer, originally printed in 1946. Although I’ve been studying and learning about fasting for years, God did something special in me after I read this book. He suddenly gave me an impartation of FAITH on top of the practical teaching He had already given me, and I am undone. Practical tips that work for me (and I believe will help you, too) to help you get the most out of your fast and stay on your fast. This teaching is 36 minutes and 49 seconds long. It’s available for instant download in my Gumroad store for $4. 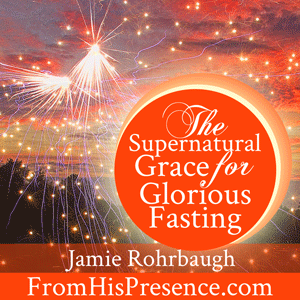 Click here to purchase The Supernatural Grace for Glorious Fasting! Atomic Power With God Thru Fasting And Prayer : THE most powerful book on fasting I have ever read in my life. This is the book the Lord used to give me a supernatural impartation of faith and glory in fasting. It’s a very small book, but it’s worth reading over and over. I have been reading a chapter each day when I fast, and the Lord has fired me up. For wonderful inspiration and specific prayer guides for a 21-day fast, read Dr. Bob Rodgers’ The 21 Day Fast: 21 Days That Will Revolutionize Your Life . I found this book very encouraging and inspiring during a fast. It also has a lot of practical tips that will be very helpful. Please go grab The Supernatural Grace for Glorious Fasting today. I believe fasting is key to the Body of Christ right now, and this teaching will bless and encourage you. Disclosure: The Amazon links above are my affiliate links. If you use these links to purchase a resource on Amazon, Amazon will pay me a small commission (at no additional cost to you of course). Thanks in advance! And if you love to read legalese, you can delight yourself in my disclosure policy here. This is incredibly timely for me. I got on the internet to look up biblical fasting but decided to read my email first and there you were on fasting! Praise God and thank you Jaime for being faithful to Him. Praise God indeed! So happy to hear that it blessed you, Jodie! Thanks for reading! So happy for this confirmation. I am in desperate need of a financial breakthrough and was feeling the unction to fast but it has been a struggle to begin again. Your blog has encouraged me to push past the hindrance and resistance. I receive God’s grace to fast in Jesus name. Thanks Jamie. Praise God. I encourage you, Diane–even if you start small (e.g. fasting one meal for one day, or fasting desserts for a period of time, etc), God will bless your commitment to Him. And it’s better to win at something manageable (e.g. fasting one meal) than to try to do something bigger if you haven’t worked up to it yet. Basically, I encourage you to give yourself grace to start small and grow! Fasting is a discipline, like physical exercise. It takes time to get acclimated. Thanks so much Jamie, for your inspiring website. I’ve been contemplating about fasting, but now I believe that I’ve got the right direction towards that. I’ll follow those steps, and pray that Lord Jesus helps me to avoid all the possible distractors. May our Lord Jesus bless you! Yes, Jamie I would love to fast with you and other like minded children of God! Thank you for all your encouraging words. Thank Once again Jammie. I am in Fiji and will fast from tomorrow and have committed to God in prayer and fasting and leaving my favorite food for 40 days.